Continuing along the scenic route of the Belvedere, we arrive at the village of Maciarello (2km from Marciana). Maciarello is a small fraction, looking at the horizon, you can see Corsica and the contours of the rest of the continent that blends between the blue sea and sky. 2km from the Bay of St. Andrew and a 15-minute walk from a beach of smooth stones ideal for those who want to escape from the chaotic beaches. A holiday in this area will give you a unique relaxation, breathtaking views and a greater peace of mind. L 'Aurora house consists of two apartments, one on the first floor with four beds. BILO 4: on the first floor with balcony entrance, living / dining room, TV, washing machine and kitchen with refrigerator and freezer, sofa bed, small hallway with access to bathroom with shower and window, double bedroom with sea view window. BILO 3: on the ground floor with separate entrance, living / dining room with TV and kitchenette with fridge freezer and washing machine, bathroom with shower ... double bed plus a bunk bed. The bathroom is simple and functional, there is the shower. The apartment was full of bugs, due to the heat, and the lack of screens on the windows. The owner was not present, and her daughter did all she could to be of help, but it was a difficult place to be. No internet and bas phone reception didn't help. The apartment was so much more than expected. It was spacy, cosy and with a great view of the sea. All in all a great place to be. If you want to get around, I would recommend a car though, since it isn't located in the city. La casa è carina la camera è molto spaziosa, ha un piccolo spazio esterno dove mangiare. Noi non l'abbiamo trovata pulitissima. Nell'annuncio c'era scritto che si poteva anche andare a piedi al mare cosa non vera in quanto le strade sono di montagna e impraticabili a piedi perche bisogna camminare sul ciglio della strada.....quindi necessita auto. È comunque vicino a spiagge molto belle come S. Andrea. Appartamento carino , immerso nel verde , zona tranquillissima, vista mare e adatto a famiglie. L'appartamento è come descritto come da sito , per arrivarci diciamo per chi non ama il rally non va bene , pieno di tornanti , curve a gomito ecc..ma la strada è abbastanza asfaltata a 15 minuti da tutto , a me è piaciuto , ha per raggiungere la maggior parte Delle spiaggie nell isola è da fare dei sentieri abbastanza ripidi , si consiglia scarpe da ginnastica . Es war nicht ganz leicht das Domizil zu finden, da es etwas versteckt von der Straße liegt. Wir mochten die ruhige abgelegene Lage aber man braucht unbedingt ein Auto. Die Verständigung war nicht so einfach weil wir kein italienisch sprechen und nur die Tochter halbwegs englisch spricht. Aber Familie Ricci ist sehr freundlich und zuvorkommend. Das Appartment ist gemütlich und geräumig eingerichtet. Die Küche ist gut ausgestattet. Es ist sehr schön auf dem Balkon zu sitzen und auf das Meer zu schauen aber zu dritt war es ganz schön eng. 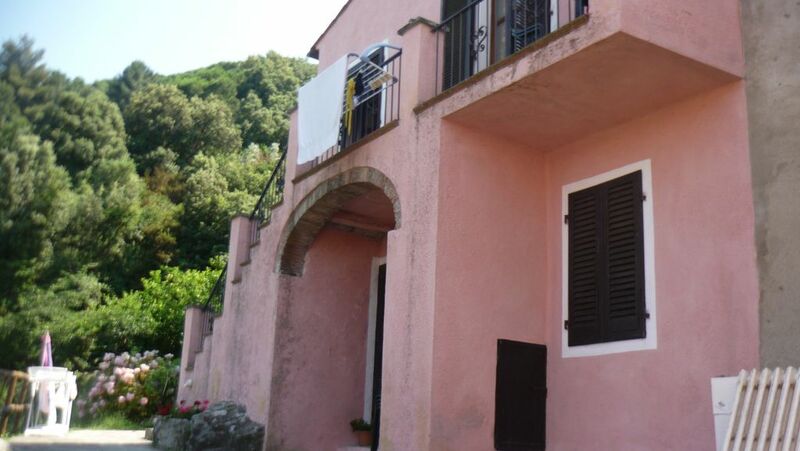 the property is located in Maciarello a fraction in the municipality of Marciana. In the area you can do many scenic routes and diving.